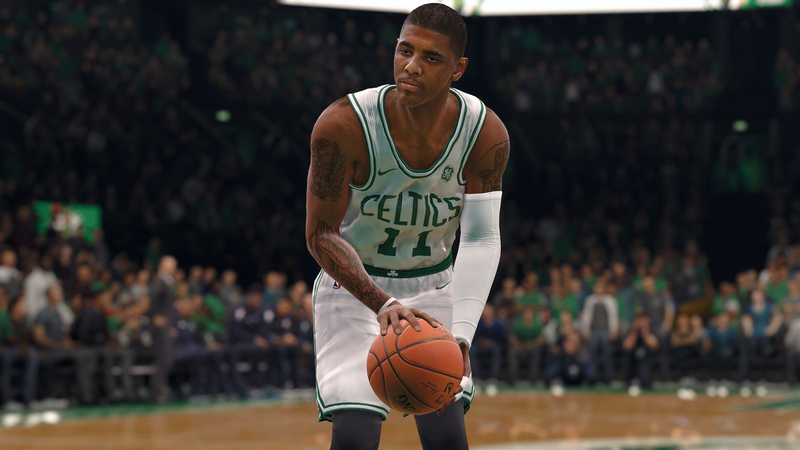 EA Sports has released NBA Live 18 patch 1.04 on Xbox One and PlayStation 4. Check out the patch notes below. Addressed a crash in Pro-Am Tour that occurred during a conversation with the Goodman League Commissioner after winning the league tournament. Addressed a crash when a player would get to Level 50 League Hype. Addressed some player likeness issues. Addressed an issue in which a user could turn off auto-subs and cause the CPU to stop making substitution. Addressed some idle issues with some instance of dribbling and hands-up animations. Improved responsiveness on right stick shot contests. Updated player ratings on items to better reflect important attributes. Added Post Offense (POST) to show how good a player is at getting to the basket and scoring from the post. Changed Shooting (SHT) to Mid-Range Shooting (MID) to better reflect a player’s ability to score off of mid-range jumpers. Changed Dunking (DNK) to Finishing (FIN) to better reflect how well a player can score around the basket with dunks and lay-ups. Well, this patch doesn't look too bad at all.. at least there's patch notes. All the missing players and missing face scans I am aware of were not fixed. No new hair styles or beards added from what I can tell. Then I thought player likeness might be animations, but Ben Simmons is still right handed in UT and Lonzo Ball's signature shot is missing in UT still. Anyone have that issue still where the camera goes to the top of the stadium before a game or qtr I'm UT mode? You basically can't see players on the court . Thankful that EA cares for this game. I'm really happy that they addressed the right stick contest, because that wasn't working at all! Excited to feel what the game plays like now. Downloading it now. This patch looks really promising. I don't think we're going to see much change in this area, if you look at the statistics of the NBA teams that don't shoot a lot of midrange, like LA, usually between 10-15% of their games are midrange, average shots per game range between 80-100, so that's only 10-15 shots per game...i typically have around 40-50 shots per game in live with default quarter times on all star difficulty...which would equate to only 4-6 midrange shots a game...sounds pretty close to what you just said...38 points, 8 not in the paint, roughly 4 shots in the first half. I think it's one of those things that's hard to balance in 5 min quarters and video game basketball...but is what it is. The pelicans...with Davis and Cousins, shoot between 20-30% from the field, still not a huge amount but I don't really see that in Live when playing them either. I would definitely like to see more midrange from the CPU...but i know we asked for that in 16 and 15 also. NBA teams on average get 40% of their points in the paint. Too often it is much higher in Live. Every team in NBA was under 50 PIP last year. Sliders will do wonders for those having issues with PIPs. Also, pace matters as well. My shot charts and PIPs have been looking really well balanced and good many games. Some teams are worse than others. Dont know if its different seems like it to me. Markelle Fultz still gets a random jersey number if you start a franchise with the 76ers. Also, 3 players have wrong jersey numbers on the sixers roster (including a duplicate number with Timothe Luwawu-Cabarrot AND Markelle Fultz both being #20.....the other two errors are TJ Mcconnell and Justin Anderson. Also, I know there are still duplicate numbers on the T-Wolves roster (Wiggins and Gibson are both #22). As far as gameplay goes, the pull-up jumpshots are noticeably smoother! The player movement seems a bit slow but I did lower the player speed slider before this patch so it seems I'll have to put it back to default. Nothing has been improved as far as I can see with off-ball movement (players still stand around for the most part). I don't really expect to see much change in the gameplay department, I think it is what it is. I think most of the issue comes from player tendencies, so hoping that gets adjusted. I did want to point this out....I played a game last night vs Golden State (BEFORE this patch became available) and the game played close to what I remembered from the demo. CPU Curry did not drive to the hole as much as some of us (myself included) have been complaining about on here. Durant put up majority of the shot attempts and the game actually played pretty good. I never felt that the CPU was over powering me to the paint on every possession. Off the top of my head the CPU Warriors had 50 PIP (final score 102, 10 min quarters, allstar default). The game played great actually. This has me thinking that some teams are just represented better than others in this game. I do see different game styles, but too many teams have the same game style. I like to test with two particular (cpu) teams - Pelicans and Lakers. Rondo and Lonzo Ball should not consistently be leading their respective teams in shot attempts. But I do hope they fix this roster stuff sooner than later though. Most stuff that you guys are talking about would be addressed in a roster update & not come out of a game patch. In my experience sliders can’t fix this. The jostle vs blow by slider is weak. If they made that slider better where we could make defence tougher to penetrate then I would agree. But i haven’t been able to fix this with sliders. Penetration is a little too easy for the cpu on all star no matter what I try. Still not enough for me to play much. You can tell me all the stats you want. You can say nba teams don't shoot much. To be honest you can come up with a stat to defend pretty much anything. The fact is the CPU doesn't run plays in NBA live 18. It doesn't run any discernible motion sets. It simply either tries to ISO and drive at all costs or feed the post. I routinely played games where you might see the CPU run anything resembling an offense maybe 5 or 6 possesions. All game. That's just not good enough for me. Has anyone heard if Live will make cosmetic changes to any of the courts? Is this something that the Live team has done in the past? Just wondering if they will ever change the color of the Sixers court (it is the wrong color)? PS- I know you guys are probably tired of me complaining about everything wrong with the Sixers lol.....so I apologize for all the sixers spam. Traditionally? No they don't have a great track record of patching in things like that. As an example the Raptors had a third jersey they barely wore that had gold(ish brown) in it. For some reason EA loved it I guess because in NBA live 16 the Raptors had brown warm up suits and brown accessories. The worst was brown shoes when you wore the away jerseys. Again that was NBA live 16. Its now NBA live 18 and it's still the same. Needless to say I don't think color "rightness" is a high priority. Anyone notice any improvements on WNBA? please address an issue where street ball to 21 is the only multiplayer online mode you have. Just give us 5 on 5 'nba rules' in some way, even if it's with real nba players, please and thankya. I realize this is a big ask, but Live is only fun online and I am already tired of 21. Could be a fluke, but I noticed a significant increase in foul calling in the two The One NBA games I played after the update. A definite improvement. are any of you guys having frame rate issues??? I just fired up a play now game N.o. vs PHX(Home) and I had some slowdown and stuttering happen. I might need to hard reset my xbox. Yup! Been getting fouls with my silly reach ins. I watched the ai play cavs/warriors 2 times to see if anything would be different, but so far I see the same issues. Curry went 4/16 in one game since instead of shooting, he kept taking contested layups. Most shots I've seen were either wide open 3's when the warriors doubled teamed Lebron in the paint, or shots late in the shot clock since the ai takes too long to get into their offense on nearly every possession. If the ai can't get to the paint, they will shoot the ball late in the shot clock as a last resort. This is why every team feels the same in this game. And I wonder if the ai is coded not to take 'guarded' shots, even though a lot of the 'bad' shots in this game are good shots in the nba. That would explain why I just seen Curry open coming off a screen, drive to the rim and brick another layup instead of shooting the ball. As someone who plays Live 18 almost every day I can say this patch is a big change. Had to lower the speed from 75 to 55 as everything is way faster now. Passing is improved and faster and overall responsiviness is great now. But me personally I liked the old "delayed" shooting better. I think it had an organic feel to it and now its just 2K like with a the way you have to hold the shooting buittong for just a millisecond . I would prefer something in between the old and the new shooting. But overall great patch which improves the game significantly. I wish Live can remove some of their ancient animations and get some brand new ones in. For example, the two hands over head pass is about 15 years old, I've seen that animation in Live 03. And to be honest, you rarely see professional basketball players pass the ball like that, that's a very amateur move. Also please change the running/dribbling animation, now it looks like everyone had hard plaster fixed on their knees that the knees don't even bend or stretch in anyway. Just played a game and I don’t notice much difference other than the shot meter which is faster and overly sensitive. I fired up two quick shots when I was trying to pump fake. Not a fan of this change tbh. One thing that still annoys me is how on a basic set my defensive matchups get confused and I will have a big guarding a small player. This happens too much. On fast breaks I understand but not basic half court sets. Your defensive assignment shouldn’t get messed up. Same thing happened to me when I tried to pump fake it also seems like there is a delay when I try to use dribble moves almost like the commands aren't registering. Played one game last night looks like they toned down the blocks THANK YOU. the nets took a lot of mid range shots and by a lot I mean more than was happening in the past but not a whole lot. They still drove and shot 3s but I did notice one thing I haven't seen. A player actually drove and stopped to shoot a mid range shot I was surprised. Lots of fouls called. I want more. We need players in foul trouble. At this point it's just game play mechanics now I'm still seeing lots of Contact and no foul called but that is NBA Live so I'll deal with it. As long as there are more fouls and they toned down then blocks thank goodness I'm good. I've been seeing midrange shots and pullups since day one. As I keep saying, this game is dynamic and can depend on how you defend the CPU. I don't know anything about CPU vs CPU games, but when I play on All-Star or Superstar, the offense basically takes what I give them. If I block their penetration, they kick the ball around and find open shots. On Superstar, I find that they move the ball extremely well and end up with LOTS of good looks on the perimeter. Got in about 20 minutes of a 5v5 scrimmage last night and it felt really smooth to me. Looking forward to playing a full game later. Like some others have said, if you stop the initial drive the computer doesn't really force the issue for me at least. The one big difference I noticed is when the CPU gets an offensive rebound, they are kicking it back out rather than going up with the ball immediately every time. This part is night and day, I saw KAT kick the ball out numerous times in one half when he should have. To all of you who feel the game is playing well with patch, are you using default sliders. I downloaded the most recent patch and played Pistons v Thunder. Im controlling the Pistons and the Thunder big 3 was basically pulling up for Guarded 3's. I do have adjusted sliders from one the sets in the slider board. Still not seeing CPU subs when auto sub is off. Playing 10 min qtrs. This vid taken at halftime of a game I'm playing now OKC (me) and LAL (cpu). Notice the minutes. Am I the only one still not seeing subs by the CPU? hopping on tonight, but how has jimmy butler been updated? hair? I've noticed that the guys will switch a lot on screens...there's a setting you can change under the coach settings in game, so hold down on the d-pad and then use RB or R1 to go over to coach settings and you can set the screen action behavior...this has helped me with some of those switches that I didn't want. Definitely noticed more fouls both ways...and the passes being tipped and deflected more than the glue hands I was seeing...passes over the middle used to be grabbed instantly even one handed...but I'm seeing more stuff get deflected. Passes directly at or to a defender are still snagged like before but that is to be expected on bad passes. This is not fixed (unless I had a fluke game). Is anyone else still seeing subs by CPU when Auto Subs is off for the user? The shot meter goes up a bit quicker now,we have to adjust our timing again. The cpu double team more often when a certain player is scoring a lot.Also if a strong offensive Big scorer takes the ball in the paint cpu doubles often. (creates the opportunity to hit more open threes). Blocks are toned down a little. They shot threes when they have the opportunity & they take a few more mid jumpers now. Not very dramatic changes but overall the patch is defenately for the better i think. Really enjoying the game with the new patch. I think it really smoothed a lot of things out. it felt so much better overall package I really enjoyed it. That would make a hige difference to gameplay. Do other people see this happening also? I played one game yesterday before the Indians Yankee game and I also noticed the same. I see more cpu step back jumpers now. I still see too much of PGs in the post but I had a fun game this morning. I would like to see more pick and pop with stretch forwards. Never seem to see that. Game is evolving into a better playing game that’s for sure. I don’t expect it to be perfect and as long as the tweaks for the better keep coming I will keep playing. Gotta love having 2 viable options. Thanks EA and 2K!! Shouldn’t they? It’s their game lol. I haven't seen this personally. I still see too many automatic putbacks. Nba live 16 with all its problems at least had good ball movement and motion by the CPU. It lacked a mid range game as well but at least the CPU had a contingency plan if you denied them the rim. Its a bug that patch supposed to fix but it got worst instead.In my franchise althought i had at settings auto subs & time out set to ON, the cpu didnt sub & a found out that every game i started the option was set to OFF by the game & that was happening in the next games so cpu didnt sub. Still see the crowd audio cut out when i was playing a online head to head game. After a called timeout the crowd returned to normal. This is different from the overtime crowd audio cut out. I have yet to have a overtime game post patch to see if that crowd audio cut bug is still in the game. The random error code disconnect still happens sometimes in the 1st quarter post patch in online head to head. This is different from when a opponent is getting beat soundly and they rage out. New update dated 10/6/17 just came across my game. And yes I've been playing since after that date. So far I noticed Lakers with 4th jersey added. Looks like they fixed Fultz having a random number when starting a franchise. I’m still hoping we get an updated Ben Simmons scan. Warriors, Bucks, Suns, Indiana, Hornets, Lakers, Hawks and Heat all have new Classic jerseys. Awesome! I was chatting with a couple of the devs about this issue over the weekend! Glad they finally fixed it! Let's say I start a franchise today, and they update a players scan on my team, would I have to restart the franchise to have the updated scan? If they want to save this franchise, they need to patch in create a player and be able to edit players in franchise. It's absolutely ridiculous how they would leave this out. Give us Create a player and edits and than say awesome, not almost a month after game comes out and they finally edit a players number correctly! Yes, the player scans will update. You just don't get roster updates, it will be the rosters from day you started and any transactions that take place in the franchise. Crowd audio bug still happens when overtime starts. Had a great online game. Started it around 12:45am eastern time. Maybe that's the time when the game runs more smoothly with less people online on the servers. He really shouldn't have to. At least put him in even without a face scan if that's what they're waiting for. He's a starter. He should be in. For some reason when installing the update my internet connection got disrupted i had to resume the download it finished right away when i click to play with the cavs kyrie is still on the team and wade with bulls. Do you know how i can get the update with new rosters, i tried reinstalling update patch but there is no option it says its been installed but i dont know that it fully did. How do i delete the patch update and try to reinstall? I'd uninstall the game and see if that works. I did uninstall the game and still the same says 1.04 is installed to. Sounds like the game isn't able to verify your data online and thus, not showing the updated rosters. The PS4 recently had a firmware update to 5.0 which changed the online service terms and conditions and in doing so, automatically logs everyone out until they accept the new T&C. Go into your PSN profile and accept them and that might do the trick and allow you back online.